No famous birthday today, but three for tomorrow so let’s celebrate Carolyn Gold Heilbrun (aka Amanda Cross) January 13, 1926 – October 9, 2003 a day early. She’d probably quite like getting in early, she never was one for conventions. Described as the Mother of feminist academia (personally not sure I’d want to be described as the mother of anything much, but there you go! 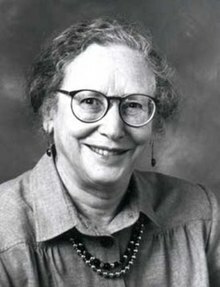 ), she was a scholar who wrote extensively about Virginia Woolf, and wrote detective novels featuring a female academic under the name Amanda Cross. Although married, she was unsentimental about her children, refused to take on the role of unpaid carer for her grandchildren, and bought a separate house so that she could get away from the domestic role when she felt the need to sit by the fire and think unencumbered. She was much given to acting on principle and being practical about things, which included ending her own life when she felt it was time. In later years she disliked social gatherings prefering to meet friends one to one, so she wouldn’t accept the invitation to a party – perhaps we’d have to arrange to meet on a park bench, with a flask of something warming and a really good ginger biscuit. So Carolyn is another of those admirable women I’m not sure I’d actually get on with, so let’s celebrate another birthday: today is my friend Penny’s birthday. Penny is the owner of Lavender Lifestyles, a website that provides an outlet for lesbian artists and craftswomen to sell their work – an excellent place to find a birthday present for the lesbian in your life! She also taught me computer skills a very long time ago, which led to me writing Mosaic of Air, so thanks, Penny, and Happy Birthday! This entry was posted in feminist, history, Lesbian, The Historical Birthday-Tea Party and tagged Academia, Amanda Cross, Carolyn Gold Heilbrun, Feminist, Lavender lifestyles, Virginia Woolf by Cherry Potts. Bookmark the permalink.